Many people suffer from one kind of allergy or another. 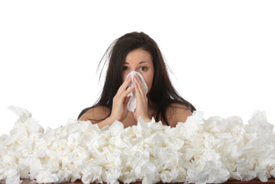 It can be bothersome when your allergy starts getting the better of you. It’s possible that chiropractic care can help mitigate even dust and pet allergies. An allergy is a hypersensitive reaction to any substance that is typically harmless to other people. Some people are allergic to certain foods such as peanuts or milk, while others may be allergic to cats. Common allergic symptoms include skin reactions, sinus irritations, and difficulty breathing. People who suffer from food allergies may experience indigestion or diarrhea. This leads to the question why some people are allergic while others aren’t. One reason is that our immune system is mostly responsible for disposing of harmful or dangerous substances that we may have ingested. It does this through sneezing, coughing, inflammation or vomiting. However, an allergy is a response of the immune system against something which isn’t necessarily harmful. It happens because our immune system misinterprets the substance in question as being potentially harmful. Can Chiropractic Care Be Helpful? There are many benefits of chiropractic adjustments for the nervous system, which is the central control system of the body. Proper communication between the spinal cord and brain ensures strength and proper functioning of the immune and respiratory systems. Any interruptions in this communication can result in decreased immunity, which can lead to allergies. Thus, manipulation of the spinal joints through chiropractic adjustments can help balance immune response and reduce allergic hypersensitivity in the long run. Vertebral subluxation and spinal dysfunction is one of the many potential causes of hypersensitivity and chiropractic care can help mitigate that. For more information, contact our office today at (541) 389-1191 and be on your way towards a healthier, happier life.